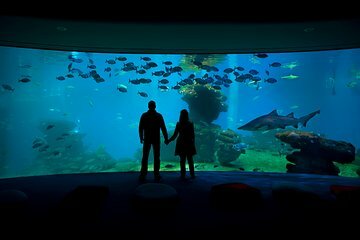 Come face-to-fin with sharks, tropical fish and sea turtles at Palma Aquarium with this family-friendly experience, which includes a skip-the-line ticket and round-trip transport from Palma de Mallorca cruise port or your hotel. Skip the long entrance lines and dive straight into the incredible marine world at Palma Aquarium. Admire vibrant coral reefs, walk through a tunnel that runs through the deepest shark tank in Europe, and get up close to seahorse, stingrays, clown fish and more. Upgrade to include a stopover in Palma. Observe amazing sea creatures including sea turtles, hammerheads and tropical fish, and see the deepest shark tank in Europe! Eastern area visitors can upgrade to include a stopover in Palma, for free! After convenient hotel pickup from select Mallorca hotels (see the Itinerary for a full list), you’ll travel to the lively city of Palma to browse engaging exhibits inside Palma Aquarium. Gaze at vibrant coral reefs and more than 700 species of marine life as you explore the underwater-themed park. See a range of creatures from the Mediterranean Sea and Indian and Pacific Oceans, and gaze at fascinating sharks in the Big Blue — Europe’s deepest shark tank. Admire 55 tanks brimming with tropical fish, including clown fish, stingrays and hammerhead sharks, while enriching your knowledge of marine biology. Palma Aquarium is sure to delight both children and adults alike: visit the kids’ area to play on a pirate ship or relax on a gorgeous beach beside the Mediterranean Sea. When your time at the aquarium comes to a conclusion, return to your Mallorca hotel in an air-conditioned vehicle. Palma Sightseeing Option: Those staying in the east of Mallorca can opt to sight-see for a few of hours in the vibrant city of Palma. For no additional charge, you’ll be transferred to Palma to spend free time among the city’s historical highlights. See landmarks such as Palma La Seu Cathedral and Almudaina Palace before returning to your hotel on the east side of the island. Refer to the Itinerary to find out which area of the island your hotel is located. • North area includes the following locations: Port Alcudia, Port Pollensa, Cala San Vicente, Playa de Muro, Can Picafort. • South area includes the following locations: Paguera, Camp de Mar, Santa Ponsa, Cala Viñas, Magalluf, Palmanova, Cala Mayor, Portals Nous, Illetes, Palma, Son Armadans, Arenal, Can Pastilla, Playa de Palma. • East area includes the following locations: Colonia Sant Jordi, Cala Santanyi, Cala Figuera, Cala Barca, Porto Petro, Cala Dor, Cala Ferrera, Cala Egos, Porto Colom, Calas de Mallorca, Cala Domingos, Cala Murada, Cala Ratjada, Canyamel, Font de Sa Cala, Cala Mesquida, S'illot, Cala Millor, Cala Bona, Costa de los Pinos, Porto cristo, Sa Coma. The aquarium was amazing. Really good day out for our 1 year old and plenty to do. Je regrette beaucoup d'avoir fait appel à vos services pour la visite de l'aquarium de Palma! Le lundi matin, j'ai téléphoné à votre contact pour le transfert de mon hôtel il m'a répondu, sans être aimable du tout, de lui envoyer un mail et a raccroché! Indigne! Au final, on y est allé à pied. Le prix demandé, 57 était trop cherpartout on pouvait avoir l'entrée à 41 pour deux! Nous ne passerons plus par vos services, c'est sûr!